Yet another teaser for "American Horror Story: Freak Show" has reared it's creepy head and this one has undertones of Slenderman. Perhaps? 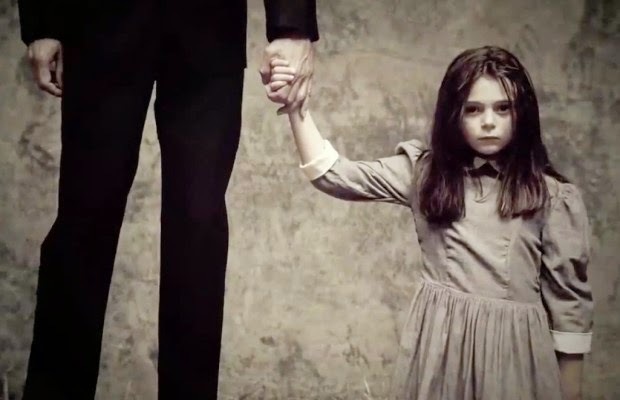 He wasn't around when the series takes place but there's just something about an extra tall, slim man holding a little girl's hand that is reminiscent of the urban myth. Check out "Extremes" and lets us know if you agree. We're banking on quite a few extremes starting on October 8. Episode 4.01, “Monsters Among Us"
Written by Ryan Murphy and Brad Falchuk, and directed by Ryan Murphy. A citywide curfew threatens to shut down the Freak Show. A strongman from Ethel’s troubled past arrives at camp. Gloria arranges a terrifying play date for Dandy. The Tattler Twins reveal a talent that could knock Elsa from the spotlight. Written by Tim Minear and directed by Alfonso Gomez-Rejon.